Do you know what pattern that is? How weird and cool is that! I'm so excited to find another picture of a completed project using this pattern. And this is just beautiful! Beautiful! I found a bag of way cool fabric for $1 at our LQS yesterday and decided I like it with the Hunky Dory colors I have....hmmmmm. Also found this softly lovely by Hazel. The story behind this piece celebrating renewal is breathtaking and inspiring. I love being able to read through blogs and make a connection with the authors not only on a quiltey level, but on a deeper level as well. What a privilege when stories, hearts, emotions and histories are shared. From all over the world, women speaking a common language using needle and thread...and their love of quilting. This week I've working on more nine patch blocks for the Jack's Chain I'm making. I originally found the pattern at Quilter's Cache. I thought QC's instructions were fairly simple and easy to follow, but I wouldn't mind taking a look at the Quilter's Club book to see their instructions. I started with 1 1/2" wide strips from a jelly roll of Moda's Hunky Dory and 1 1/2" wide strips of white. Using a 1/4" seam, I sewed two white strips to one of the Hunky Dory strips, and sewed two of the Hunky Dory strips to a white one so cutting and sewing the nine patches needed would be easier. Here is what your new strips should look like. The one that has the two Hunky Dory strips on the outside will be the outside units of the nine patch and the strip with two white pices will be the center unit of the nine patch. Careful pressing keeping the seams as straight as possible will help keep the nine patches from being wonky later on. Go ahead and true up one side of the newly sewn strip so you're rotary cutting will be even. Here are your strips cut into units you will use to make the nine patch. Lay out your units to make the nine patch and sew together, again with a 1/4" seam. Carefully press the nine patch keeping the block as evenly square as possible. Now you need to square up your nine patch block with your ruler and rotary cutter to 3 1/2". Next time I'll be working on adding these new nine patch blocks with a triangle and hexagon to the quilt. Today I'm linking up with Heather and Megan at Quilt Story for my very first Fabric Tuesday. Through the winter here in Indiana...it can get really dark, gray and depressing. 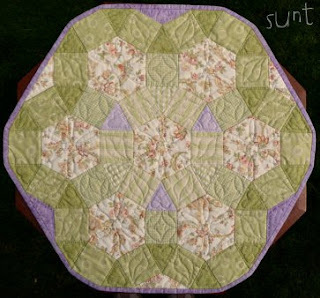 I love the linky parties that let me have snippets of sunshine peak through with all the bright, happy and cheerful projects other quilters share! I'm also linking up with Kimberlee for my first Finished It Friday so there's lots to so and see when you follow the links and see all the other beautiful projects! ooh! I like Jacks chain now too!!! those are beautiful samples Dee! thanks for sharing! I totally agree on connecting with other women and finding we have the same loves in sewing, Christ and other likes! I love Jack's Chain~I love anything 9-patchey! Have a good week my friend. I love this pattern, your quilt will be beautiful. The pattern looks very effective. Great work. Wow, love the movement in that quilt. I'm definitely going to have to take a look at that one. That is a gorgeous quilt for your first Fabric Tuesday, great job! Hi! That quilt is going to be beautiful! I would love to make that, too! I love also your fabric baskets! Lovely beautiful quilt! So great to work with 9 patch - the possibilities are nedless, and your colors are great! wow!!! your hex/triangle/9 patch is STUNNING!!! i think i actually gasped when i saw it on quilt story. I love this! I'm pinning it to make!! Awesome!